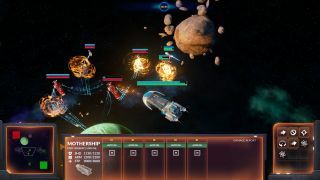 The developer of Starfall Tactics, a space-based multiplayer RTS currently in the midst of a run on Kickstarter, has released a new trailer entitled "Memories of War" that takes a look at the game's three factions—none of whom seem particularly happy about the ongoing conflict that's consumed their lives—and also shows off some brief snippets of gameplay. You'll notice, if you stick around to about the 1:30 mark, that the gameplay all appears to take place in two dimensions, despite the three dimensions that exist in the black void of space. As Snowforged Entertainment explained in this April dev diary, the studio made the choice after deciding that the complexity of 3D combat is not "inherently good." "Utilizing a 2D plane allows us to avoid [perception and control] issues altogether and focus on what's really important—creating a combat system that has depth," the studio wrote. "What about players that want to get picky and say that using a 2D plane for space combat is less realistic? I'd like to remind them that we are talking about a game experience here. If developers always had to abide by the rules of 'realism', combat in space would be one heck of a boring affair." To keep battles engaging, the studio is focusing on a high degree of customization options, with "comprehensive damage models," including destructible sub-systems, line of fire, and the ability to ram other ships. There will be two "main modes" of play, Quick and Ranked, which will provide matches of ten to 20 minutes in length, but more interesting (to me, at least) is the Galaxy Conquest mode, which will see thousands of players interacting on a large persistent map complete with pirates, mercenaries, and NPCs. Galaxy Conquest will support solo and co-op play, with various types of 4X-style missions, and rewards that are commensurate with risk. Starfall Tactics will be free-to-play, which Snowforged acknowledged won't thrill everyone. But they noted that newer free-to-play releases like Hearthstone and Heroes of the Storm have done quite well, and say they plan to model the game on similar principles, with regular distributions of "booster packs" that will supplement the blueprints earned through normal gameplay. The Kickstarter is roughly halfway to its $45,000 goal, with 13 days remaining. That's not an especially encouraging pace, but the team said in a comment that the game will be released regardless of whether the crowdfunding is successful. "Should the KS campaign not work out, we will continue working on Starfall Tactics as planned and will release the alpha version this Autumn," they wrote. "The main set-back would be a reduced amount of content for alpha, as well as slower pace of development." More information about the game, which was recently given the greenlight on Steam, is up at StarfallTactics.com. For those who like to fiddle, a pre-alpha build of the Starfall Tactics ship editor is also available.